Congratulations to "LS", the winner in Emma's giveaway. Thank you to all who participated! As I sit here thinking about this blog post I wonder where my writing journey will go in the next year. I have set goals and yet I know that life will get in the way at times and possibly slow me down in my writing process. Writing is therapeutic for me though as I write about life issues. 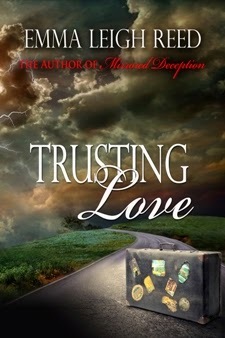 Trusting Love centers on domestic violence and how hard it is to trust again after being in that situation. With each book I have written there has been a piece of me in it. I dealt with a domestic abuse situation, and although my situation was less violent than others, the scars that follow such a relationship take a long time to heal. Writing, for me, helps that healing process and gives me hope that I can reach the next person who needs strength to get through the challenges this type of relationship can bring. I don’t plot my books formally. I spend a lot of time thinking about my characters and how I want them to develop, but when I start writing the words just start coming and if they veer away from the loose plot I have, so be it. As I write, my characters become a part of my life. Either I relate to them, or I don’t. If I do, the story flows so easy and words fly across the page. If I don’t, then I need to spend more time thinking about this character, interviewing them and getting to know them to see what makes them tick. So as we head into year 2014 I have set the goals of having three new books published. The informal plotting process is going on in my mind and characters are forming, telling me who they are and what makes them tick. There will be new issues to deal with and new character flaws that I will need to work through. I hope you join me in this coming year’s progress and put reading on your list of things to do. Chloe Wilder shot up in bed. She rubbed her eyes with the back of her hands trying to adjust to the dim moonlight that filtered in through the closed blinds. Her heart raced as she took in the shadows that danced around the room. She swiped her hand across her face to wipe away the tears the nightmare left behind. Wrapping her arms around her knees, she hugged herself tight. She pushed the covers off, jumped out of bed, and crossed to the window. It was dark except for the light of the moon. No street lights were lit. There was no better time than now. She pulled on an old pair of sweat pants and a baggy sweater. She dragged an old tattered suitcase from the closet and started packing. A sense of urgency came upon her as she shoved in the last shirt and closed the suitcase. She glanced around the room and her eyes stopped on a picture of her parents. They held each other, smiling. It was obviously taken at a happy moment. She picked up the picture and looked closer. Sadness and shame overwhelmed her. Holding it close, Chloe closed her eyes and prayed for forgiveness for the mistakes she had made in her life. Putting the picture in her purse, she picked up the suitcase and slipped through the door into the night. She threw the old suitcase in the backseat of her beloved Toyota. The vehicle was on its last leg, but somehow it kept running. Chloe prayed it would take her far away from this town, and even further from all the pain. She needed a fresh start for her and her baby she vowed to protect. Choice of print copy of TRUSTING LOVE, or ebook. Giveaway ends 11:59pm EST Dec. 30th. Please supply your email in the post. You may use spaces or full text for security. (ex. jsmith at gmail dot com) If you do not wish to supply your email, or have trouble posting, please email maureen@JustRomanticSuspense.com with a subject title of JRS GIVEAWAY to be entered in the current giveaway. Print books eligible for US residents only. Trusting Love sounds like an exciting and emotional story. Good luck with your writing goals in 2014 and Happy New Year! Nice post, Emma! Good luck in reaching your goals for 2014. Happy New Year! Thanks for sharing your personal story and the excerpt from your latest book. Best wishes on your plans for 2014! Thanks for stopping by. I enjoy sharing pieces of myself with readers. Happy new year! Thank you for sharing your story. Good luck with the goals you set. Wishing you a Happy New Year! Your subject sounds interesting. And, I like your cover! I can't wait to read your book, you are new to me. Thank you for the giveaway and Happy New Year! The excerpt completely hooked me. Thanks for the post! I could feel the urgency in the excerpt thank you.